Mark Polishook is the kind of mentor and tutor who will help you breathe life and passion into any ambition you have to become or evolve as a pianist. Whether you are looking to fulfil a lifelong ambition to learn, or find entirely new inspiration in a skill you have honed for years, Mark is the finest guide to employ. Mark teaches in his light and airy Leicester studio, or via Skype to pupils around the world. His piano is a Steingraeber Phoenix 205, recognised as one of the very best in the world. To play such a beautiful and rare instrument, is inspiration enough to pursue being the very best you possibly can be. For those who are truly looking for a master of his craft, his many accomplishments and achievements are listed here and yet, for all of this, you will find Mark to be a funny, warm, empathetic man who will be your mentor in the most effective way for you. Surely this quality, is paramount in you succeeding at and loving the piano. Dr. Polishook is a pianist, a composer, a music technologist, and a teacher who specialises in improvisation influenced by historical and contemporary sources. Dr. Polishook has presented improvised solo piano concerts in Leicester in the UK, Craców in Poland, Hong Kong, and the United States. He’s given courses on improvisation at Jackdaws, one of the leading Music Education Trusts in the UK. Dr. Polishook’s background in jazz includes performances with jazz artists including Ted Curson, Kenny Garrett, Cassandra Wilson, Eddie Gomez, Richard Davis, Little Jimmy Scott, Sonny Fortune, and Mark Murphy. Dr. Polishook’s jazz piano teachers include Jaki Byard, Charlie Banacos, and Marian McPartland. He combines his influences from jazz with this studies and accomplishments in the realm of classical music. His opera Seed of Sarah, which was made into a film by an award-winning director has been seen worldwide. His compositions have been played in America and Europe. Dr. Polishook has a doctorate in music composition from the Hartt School of Music, an MA in composition and theory from the University of Pittsburgh, an MM in jazz piano from the Manhattan School of Music, and a BM degree in jazz piano from the New England Conservatory of Music. His composition teachers include Eugene Kurtz, Ludmilla Uelehla, Robert Carl, and James Sellars. 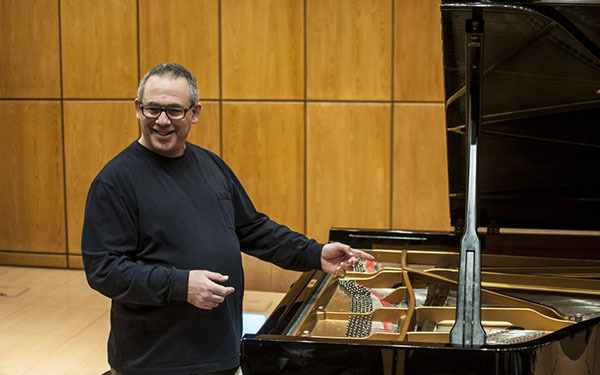 Dr. Polishook’s first faculty position after completing his doctoral degree in music was as the jazz piano and composition professor at the University of Maine at Augusta. Dr. Polishook went from UMA to to Central Washington University where for eight years he directed the music department’s composition and theory programs. Dr. Polishook also taught as a Senior Fulbright Lecturer in the Electro-acoustic Music Studio at the Craców Academy of Music and he’s been an adjunct faculty member at Montclair State University music school where he taught courses on electronic music and in the Montclair State Honors College where he taught courses on creativity, specifically on “how to be creative”. More recently, Dr. Polishook, is now the Music Program’s Internet Artist-in-Residence at the University of Maine at August where he teaches select students through Skype. 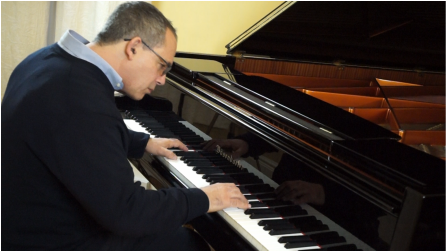 Dr. Polishook currently resides in Leicester in the UK where he teaches all things related to the piano, including improvisation and classical repertoire, jazz, composition, music theory, and music technology. He gives lessons to students in his local area and others who sometimes travel to Leicester from afar. Dr. Polishook also teaches internationally through Skype video conferencing. His Skype students include pianists and musicians on several continents, many of whom have worked online with him for a period of years. As for Dr. Polishook’s studio, it combines the best of old and new technology. It features a Steingraeber Phoenix 205, an instrument sometimes known as the Liszt Grand Piano. The first one was built in the 19th century specially for Franz Liszt, hence its appellation as the Liszt Grand Piano. Dr. Polishook’s 205 also features a 21st-century innovation, which is Richard Dain’s Phoenix system that, among other things, increases the sustain and singing character of the instrument. It’s heritage along with the Phoenix system make it a wonderful, inspiring instrument with which to demonstrate and teach about nuances of dynamics, tone colour, pedalling , and timbre. Two studio-quality microphones and a studio-quality digital-audio interface reside next to the 205 so high-quality recordings can be made when and as needed. A recent addition to the studio is a modular analogue synthesis system. These components—piano, recording equipment, and synthesisers—together created an extended musical instrument that draws from, on the one hand, the historical legacy of the piano, and, on the other, from new and upcoming innovations in music technology. Finally, these elements all come together and feature in Dr. Polishook’s solo piano concerts.